Do you work with a team of people in your business? Even if you’re the owner of the business or simply a team member, it’s nice to have support from those around you who understand your areas of expertise. Hopefully you have that. Sadly, there are large online businesses with 40 to 100 people working invisibly in the background, who have no support or direction. This is one of the silent killers of your company. You have a dream to succeed and grow. There is definitely no way you can handle the workload by yourself, so you have a team behind you. 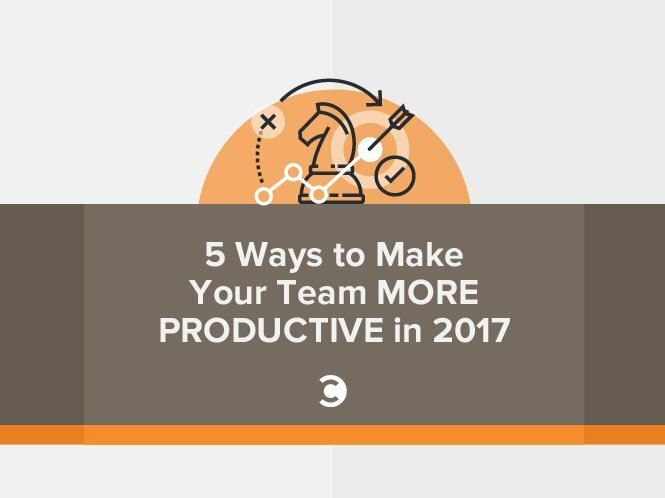 Whether you have a team of two or two hundred, here are some great tips you can use to help your team become more productive in 2017. These are listed in order as my top five best tips for more productivity in your workplace. The best leaders of your business understand the power of ownership. When one can get up in the morning and say, “I’ve got to go make my company money,” they have committed to the ownership of that organization. In their mind, it’s their business too, and as a business owner, this is what you want to accomplish with your workers. See your entire company as one team. They all work together toward one goal. Giving ownership to them can be as simple as allowing them to make decisions, lead a project, or be responsible for a task. It tells them you have trusted them with a specific job, or you have trusted them to make a decision. When you do this, it opens the door of ownership with your team member. Now what do you have? A reliable employee or contractor who sees opportunity in your business. There’s nothing more powerful at building productivity than building someone’s self-esteem in your company. In order to create a more productive atmosphere for your employees, you should understand what each person brings to your business. For example, you wouldn’t have an Amazon listings expert creating and editing images in Photoshop. I cannot express how critical this point is because knowing their skill set is the backbone of producing a productive team. Realizing what work you can give to a specific employee is determined by how well you know this person’s abilities in this area. Being more productive also shows how you should remove barriers which prevent them from getting their work done. Make sure they have the proper tools at their disposal. Simply assign according to what they’re good at. Sometimes it can be enticing to send someone a project because you’re running behind on a deadline (and they have no experience doing it). Refrain from falling into this trap because it does more harm than good. Take some time out of each week to talk one on one with each team member. Get to know them on a personal level. Find out what they have been working on that week. You may be surprised to find some hidden gems in there somewhere. A truly productive team will have a team meeting each week with their leader or owner to get them caught up on the projects they have been working on and to get assignments for the next week. During this time, you need to take advantage of team time and allow some banter to happen before the meeting begins. Tell a joke, ask about their mother, or get them to connect personally to the team. Not only does this ensure camaraderie with the other employees, it helps them to feel part of the team. This works especially well with new employees or contractors just coming on board. Make sure your team knows to welcome them and learn about them too, not just you. Use these meetings to encourage and inspire your workers. Research some content you can read to them, or tell a funny story which happened to you in the past. You can end it with a point which promotes inspiration in the eyes of your workers. You’re a cool boss. Show them how awesome you are by opening up right along with the rest of them. And remember ownership? This is a great way to establish ownership in your company as well. Sometimes it’s best for the boss to simply step aside and watch his expert team work seamlessly on their own. You have picked the best team. You have organized their talents, their projects, their clients. You also know what their goals are. Step back. Trust your team to get the job done. If you’re a lurker, it only creates havoc and chaos inside your employees’ minds. It makes them second-guess themselves. Allow them the freedom to come up with a great piece of content for a big client. They already know they’re part owner of your company. Stepping back and allowing your team to work is a form of trust. They will sense that trust, and you will be able to watch your productivity soar because you are giving them free reign to finish projects and meet goals. It’s okay to check in every now and again to see if they need help or to find out if they’re stuck on something, but that’s it. Don’t over-manage them. When you trust someone, you are letting them know you think they can handle the job. It works well for making a productive team. Communication is my number-one way to make your team more productive in 2017. Without it, your business will fail. I have worked at different companies who preached communication in the pulpit, but never lived it in the workplace. In the absence of communication comes miscommunication, and this breeds a whole lot of failure. You get a project from a client. You distribute this project to your team leaders. You help the team leaders understand what the project entails, and you pick the best employees for the job. The team leaders conduct a team meeting and communicate about the project to the employees and hands out assignments. The team leader continues to report to the owner or boss about the project and its deadline. This is normally how a client project works inside of a large company. The best person I have ever seen do this is Nathan Hirsch. Nathan runs a rather large company called FreeeUp which has over 200 remote workers who all have various talents and skills. Nate’s “one thing” he preaches is communication. He runs a tight ship, and he manages these 200-plus remote workers by communicating with each worker in a fashion which exudes greatness inside this company. Because of this practice, all of his workers start from a point of great communication within their client work. Communication can make your business thrive. When you don’t understand something, when you guess what someone wants without asking to make sure, when you assume, etc., it’s a recipe for a rather large fail because you didn’t take the extra step to communicate your thoughts or opinions about the task or topic. Your team needs to understand the importance of communication. Sometimes a team member will feel inadequate and will not want to express a question in a certain situation. As an owner or team leader, it’s up to you to sense this during meetings or discussions and learn how you can create communication with the team member. More than likely, the team member isn’t comfortable speaking out in meetings. When this is the case, you should follow up with them and ask them if they have any questions. It’s up to you to make sure you have expressed yourself well enough for everyone to get a handle on what you’re trying to tell them. One great way to do this in meetings is to make sure to have notes included in your agenda. It’s fast and effective, and your team can understand what you’re talking about quickly. Your team is a direct extension of your company. You don’t want your company to be a revolving door when it comes to hiring and firing employees, do you? Of course not! You want your business to be a place where someone loves to work—a place where they know they are being heard and respected for their talents. If you do these top five tips this year, you are going to see more productivity and success out of your team members. Do you have a great tip I didn’t discuss? I would love to hear about it in the comments.